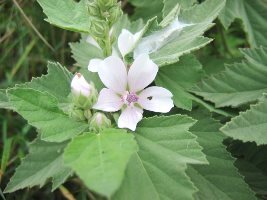 Althaea officinalis is a perennial herb to 0.5-1.2 m tall, erect. Leaves alternate, 5-10 cm long, egg-shaped, velvety textured, shallowly 3-lobed, tips pointed, base rounded to round-lobed, margin coarsely toothed. Flowers pink, showy, radially symmetrical, 3 cm wide, petals 5, free, bases overlapping, sepals 5, ovary superior, stamens fused in a central column around style, small narrow bracts at flower base 6-9, fused at base; flowers in axils along upper stem; blooming Aug.-Oct.
Fruit dry, hollow with about 15 segments, these falling off at maturity. Habitat: Salt and freshwater marshes. Notes: Hollyhock is A. rosea, usually unbranched, rarely escaping from gardens.